The company’s broad list of clientele, comprises of hundreds of names such as governmental and semi-public organisations, public and private companies, municipalities as well as many private individuals. KARIX appreciates and thanks each client individually for choosing and placing their trust in its products. We invite all our clients who would like to express any comments, suggestions or observations to communicate with the management via email. We have known the KARIX company and its people for a long time now because we are in the same industrial area and have constant contact with them since they use several of our products. When we wanted a covered area built for our business needs, we had no reason to look anywhere other than KARIX. The reason we limited our choice to KARIX was because we can see from close quarters their professionalism at all stages of construction and not just because they are our customers and we have a friendly relationship. We believe that the people at KARIX are the most professional people in their field and their products are always of the highest specifications. It was our pleasure to give our consent for these comments to appear on the KARIX website. My family and I are absolutely delighted that we chose KARIX Industry Ltd. for the construction of our prefabricated metal country house. The soundness and high quality of the construction, the excellent aesthetic results and compliance with the requirements and time-schedules, confirm the correctness of our choice. Moreover, the selection of this type of accommodation and the specific construction solutions it offers minimises maintenance costs and reflects a contemporary lifestyle that expresses us. I was looking to buy a prefabricated construction as a last resort solution. I contacted various companies and made several inquiries. I talked with the responsible persons. I asked the usual questions, i.e. how much does it cost, what kind of structure is it, can it be done in this or another way? I always left with a feeling that for them this was nothing other than a cold transaction and all of the options seemed identical to me. It is quite sensible for anyone to weigh things up and consider his options whenever he is about to make any purchase, whatever it is. Quite by chance, I was taking a walk around the Industrial Area of Ergates and I went into the KARIX factory. I just walked in, thinking of other things, I am not sure what. However, what was missing from the other encounters I had had, I found it there… a generous smile, a warm handshake, and a cup of coffee. We drank our coffee and discussed various aspects until we reached a conclusion. Furthermore, I felt that all these things were not part of a marketing game. To cut a long story short, both my wife and I felt comfortable. Here, I would like to point out that I am completely ignorant of similar types of transactions. What I always want is that, whatever I pay, at any price, reflects its true worth and quality even in an hour of need and to receive good service. All these things I found at KARIX. Ultimately, it was not a last-resort-solution but the best solution I could have had. I’m completely satisfied with my purchase. For two years we have been looking for a solution for a prefabricated country house. We wanted something simple and functional with no-frills in minimal line. From the very first meeting we had with the people from KARIX we were impressed. We found exactly what we were searching for. We were provided with advanced ideas that combined style, comfort and quality. And something else! We had our house in no time at all within the agreed schedule and without the aggravations of “having my own house built”. The main characteristics of the KARIX Company are consistency and reliability. Our collaboration was more than perfect. I had the pleasant experience to work with KARIX on two projects. On the first, I designed four metal cubes placed side-by-side to be used as workshops and a “bridge” that connected them to a listed building. To my surprise, I noticed that the people of KARIX felt it was their special duty to resolve any technical issues with an unusual sense of aesthetic awareness, a very necessary link to proceed safely from conception-design to construction. This fact instilled in me the necessary confidence to conduct our business. I would like to point out that there was no necessity to intervene for corrections. The second project concerned essentially the conversion and arrangement of four standard prefabricated constructions on a farm. My role was not a creative one. I acted as a consultant to both the owner and the constructor. The aim was to serve the needs of the farm owner, to maintain the lowest possible cost and to unify the construction in the superb landscape, namely the Baths of Aphrodite in order to take advantage of this unique view. On the other hand, the manufacturer had to ensure the aesthetic quality of the modifications of the standard constructions and this was achieved to the maximum extent. The finished result was undoubtedly a success, given that the design details that I suggested were adopted in subsequent new projects. We can now see large openings and more generous use of new lining materials on external surfaces. I sense a strong desire to find new materials that would enhance the aesthetic needs wherever the customers demand it. 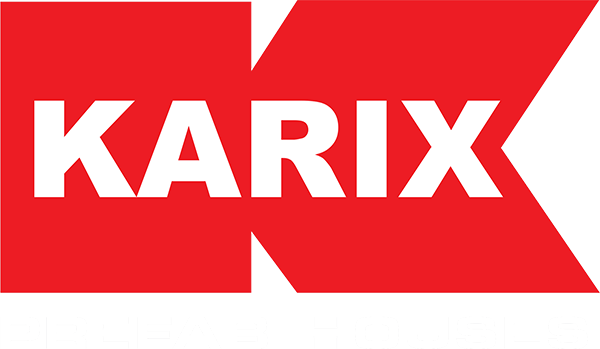 If new customers address their needs with imagination and search for new ideas in prefabricated constructions, then KARIX can provide solutions that are both highly effective and aesthetic. High aesthetics need not be expensive! When the immediate need arose to accommodate the growing number of students at our school, we turned to one of the most famous architectural firms who suggested as a solution the construction of prefabricated classrooms and introduced us to KARIX. We wanted a quick and cost effective solution until our new school building was completed. We also wanted the classrooms to be functional, built with quality materials that inspired respect, security and confidence amongst the parents and students of our school. All these we found in KARIX and we recommend it unreservedly. Through my personal experience as a customer, I strongly recommend KARIX for prefabricated solutions. I consider KARIX as the most reliable as well as qualitative solution regarding prefabricated constructions. The variety of its products and the capability to tailor each design to suit your own needs in conjunction with the correct, professional yet human approach, make KARIX a leader in its field. When you buy from KARIX, you feel 100% sure that you have made the right choice. George Georgiou, Managing Director – Cypra Ltd. When my business needs necessitated the construction of a large number of prefabricated rooms for staff accommodation, I conducted a market survey and concluded that KARIX Industry Ltd. was the most suitable. With the experience I gained as a Managing Director for many years in various large companies, I soon realized that all KARIX personnel are professionals in their field, in the wider sense of the word. Therefore, I proceeded to collaborate with them and I am completely satisfied with my choice. Quality, consistency and professionalism were the factors that led to my decision to order the prefabricated double room I needed from KARIX. With the professionalism that distinguishes Mr Kyriacos Karicos, the company’s Managing Director, in conjunction with his talent in design and the wide range of available materials, he presented to me, in a very short space of time, the desired solution in the location of my choice. For three years now, we haven’t had any problems in either the structure or the painting of the construction and, consequently, in order to express my appreciation, it gives me great pleasure to recommend unreservedly KARIX for your needs in any prefabricated constructions. Charis Kambanis, Sales & Marketing Dept. – Elysee Irrigation Ltd.
We collaborated with KARIX and the company distinguished itself among our suppliers for its consistency, professionalism and the high quality of its products.